"Garage (house)" redirects here. For the music style, see Garage house. For other uses, see Garage (disambiguation). A residential garage (/ˈɡærɪdʒ/ or /ɡæˈrɑːdʒ/) is a walled, roofed structure for storing a vehicle or vehicles that may be part of or attached to a home ("attached garage"), or a separate outbuilding or shed ("detached garage"). Residential garages typically have space for one or two cars, although three-car garages are used. When a garage is attached to a house, the garage typically has an entry door into the house. Garages normally have a wide door which can be raised to permit the entry and exit of a vehicle, and then closed to secure the vehicle. A garage protects a vehicle from precipitation, and, if it is equipped with a locking garage door, it also protects the vehicle(s) from theft and vandalism. Garages are also used for a variety of projects including painting, woodworking and assembling of projects. Some garages have an electrical mechanism to automatically open or close the garage door when the homeowner presses a button on a small remote control. Some garages have enough space, even with cars inside, for the storage of items such as bicycles or a lawnmower; in some cases, there may even be enough space for a workshop or a man cave. Garages that are attached to a house may be built with the same external materials and roofing as the house. Garages that are not connected to the home may use a different style of construction from the house. Often in the Southern and rural United States garages not attached to the home and made from a timber frame with sheet metal coverings are known as "pole barns", but usually serve the same purpose as what is called a garage elsewhere. In some places, the term is used synonymously with "carport", though that term normally describes a structure that, while roofed, is not completely enclosed. A carport protects the vehicle to some degree from inclement weather, but it does not protect the vehicle from theft or vandalism. The word garage, introduced to English in 1902, originates from the French word garer, meaning shelter. 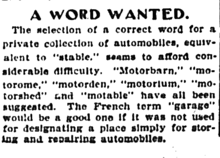 By 1908 the architect Charles Harrison Townsend was commenting in The Builder magazine that; “for the home of the car, we very largely use the French word ‘garage’, alternatively with what I think the more desirable English equivalent of ‘motor house’. In northern climates, temperatures inside an uninsulated attached residential garage can decrease to freezing levels during the winter. Temperatures inside an uninsulated attached garage in temperate climates can reach uncomfortable levels during summer months. Extreme temperatures can be a source of energy waste and discomfort in adjoining living areas, due to heat transfer between the garage and those areas. Homes with an attached garage often experience this "interface" problem. Insulating the outside of the building against the elements without extending the insulation to the wall separating the garage from the house, and/or the other garage walls and roof, can be a costly mistake. Australian homes typically have a two, one and a half or double car garage, with some newer houses having a triple garage, with one double door and one single door. Prior to the 1970s most of them were detached from the house, usually set further back with the driveway leading up past the side of the house, common with old fibreboard houses, but not uncommon with earlier brick houses. The most common doors on these garages were either 2 wooden barn style doors with a standard sized access door on the side of the garage, or the B&D Rolla Door, which is described below. The most common garage door to date in Australia is the B&D Rolla Door, having been around since 1956 and still in heavy use today. They are a corrugated flexible but strong sheet steel door, sliding up tracks and rolling around a drum mounted above the door opening on the inside of the garage. These come in manual and remote controlled electric (known as the Control-a-Door), with conversion kits available. Locking is provided by a key lock in the centre of the door moving two square sliding lock bars in and out of holes in the door tracks, locking and unlocking it, or by the solenoid lock in the automatic motor. Newer homes feature more American styled tilting panel lift doors which slide up onto a track on the ceiling via a motor and chain drive. Since the late 1970s most if not all garages are attached, and throughout the 80's it became more common to have an access door into the home from the garage where design permitted, whereas it is commonplace now. Most older unit (apartment) blocks in Australia have garages on the ground floor accessible through a common hallway and access doors, all leading into a common driveway. Newer ones now have underground parking. Australia has strict guidelines in place when building a home and the garage size must conform to the Australian Standards. The minimum size for a single garage is 3.0 m x 5.4 m (9.8 ft x 17.7 ft) and a double is 5.4 m x 5.4 m (17.7 ft x 17.7 ft). However, to comfortably fit two cars in a double garage it is typical to have a size of 6.0 m x 6.0 m (19.7 ft x 19.7 ft). British homes featuring a garage typically have a single or double garage either built into the main building, detached within the grounds (often in the back garden), or in a communal area. Traditionally, garage doors were wooden, opening either as two leaves or sliding horizontally. Newer garages are fitted with metal up-and-over doors. Increasingly, in new homes, such doors are electrically operated. Typically, a small British single garage is 8 by 16 feet (2.4 m × 4.9 m), a medium single garage is 9 by 18 feet (2.7 m × 5.5 m), and a large single garage is 10 by 20 feet (3.0 m × 6.1 m). Family sedans have become bigger than they were in the past, so the larger size has become a preferred option. A typical large family car like the Ford Mondeo is about 15 by 6 feet (4.6 m × 1.8 m), meaning that even with the larger size garage, it is necessary to park to one side to be able to open the driver's door wide enough to enter or exit the vehicle. In the early days of the motor car, a garage played in important role in protecting the vehicle from the weather (particularly so as to reduce rust). It was also the case that early motor cars started more easily when they were warm, so that keeping them in a garage rather than outside made it easier to get the engine going in the morning. Modern motor cars, however, are very well protected against rust, and modern engines start with no difficulty even in very cold conditions. The common term for these structures in the first decades of the 20th century was motor house. Many garages from before 1914 were pre-fabricated, typically by companies such as Norwich manufacturer Boulton & Paul Ltd. The style was usually in keeping with that of the house and its locale, however, they were mainly of timber construction and few have survived. E Keynes Purchase, ‘honorary architect’ to what was to become the Royal Automobile Club, did a lot of work on them and recommended in The Car Illustrated in 1902, that they be of brick construction with cement floor, an inspection pit, good electric lighting and a pulley system for removing parts of the car (in the early days of motoring many car owners were mechanical and engineering enthusiasts). The architecture of garages was ignored in the architectural journals despite famous architects such as Edwin Lutyens, Richard Barry Parker and Edgar Wood all designing garages for their wealthy clients. Charles Harrison Townsend was one of the few architects who put pen to paper (in The Builder in 1908) on the subject and recommended that the walls be glazed brick for ease of washing, air gratings to be low (petrol fumes are heavier than air) and drains half open to avoid build-up of gases. By 1910 corrugated iron and asbestos were being used instead of wood and garages became less imposing. From 1912 speculatively built houses in London were being built with motor houses. Many garage doors open upward using an electric chain drive, which can often be automatically controlled from inside the resident's vehicle with a small radio transmitter. Garages are connected to the nearest road with a driveway. Interior space for one or two cars is normal, and garages built after 1950 usually have a door that connects the garage directly to the interior of the house (an "attached garage"). Earlier garages were often detached and located in the back yard of the house, accessed either via a long driveway or from an alley. In the past, garages were often separate buildings from the house ("detached garage"). On occasion, a garage would be built with an apartment above it, which could be rented out. As automobiles became more popular, the concept of attaching the garage directly to the home grew into a common practice. While a person with a separate garage must walk outdoors in every type of weather, a person with an attached garage has a much shorter walk inside a building. Around the start of the 21st century, companies began offering "portable garages" in the United States. Typically, these garages are made of metal and do not connect to the house or other structure, much like the garage built before 1950. Garages are also produced as composite fabric garages with metal frames that are lightweight and portable garage compared to traditional brick-and-mortar or metal garage structures. Many homeowner's associations frown upon the installation of these nonconforming buildings, but still, their popularity is increasing. Over the last decade, garage flooring products have become more readily available to the general public. In fact, the volume of garage flooring on the market today can serve as a source of frustration and confusion for homeowners. Generally speaking, these products can be broken into the following categories: garage floor mats, garage floor tiles, coatings (including epoxy, urethanes and hybrids), sealers and densifiers as well as garage floor containment systems. The first planned private garages appeared long before 1900. Early examples of planned public garages appeared at the same time. The first recorded public parking garage in the US (Electric Vehicle Company Garage, Chicago) was built in 1898, in the UK (Christal Palace Garage, London) in 1900 and in Germany (Großgarage der Automüller G.m.b.H., Berlin-Wilmersdorf) in 1901. Possibly the oldest existing garage in the United Kingdom is in Southport Lancashire. It was the first motor house or garage to be depicted in an English motoring journal and was in The Autocar of 7 October 1899. It was owned by Dr W.W. Barratt, a local doctor and motoring pioneer and specially designed for his house at 29 Park Crescent Hesketh Park. A two-storey building that matched the style of the house; the ground floor garage having a concrete floor, heating, electric lighting, an engine pit and was fully equipped. The motor house is now in residential use. One of the oldest surviving private garages in Germany today is the 1903 finished Automobil-Remise (automobile carriage house) of Villa Esche by Henry van de Velde in Chemnitz. Carl Benz, the inventor of the automobile, had a tower built for himself in 1910, on the first floor a room for studying, on the ground floor car parking space. It still exists in Ladenburg, Germany. American technology company Hewlett-Packard was started in a garage. That garage, the HP Garage, is now a museum. Garages in the United States and Canada used to store streetcars and buses are often referred to as carhouse or car barn. These storage facilities are either metal or brick structures used to store streetcars or buses away from the elements. In Britain they are referred to as bus depot or depot. Look up garage in Wiktionary, the free dictionary. Wikimedia Commons has media related to Garage. ^ "Single & Double Garage Size (How Much Do You Need?)". BuildSearch. 2018-08-17. Retrieved 2018-12-13. ^ "Starting Old Cars". Retrieved 2013-05-24. This whole operation takes a certain amount of time. On a 50-degree day, for instance, the car won't operate normally for at least 5 minutes of driving. On colder days you might spend 10-15 minutes "nursing" the car until it warms up to normal operating temperature. ^ "Copy a garage door opener - how to do video". thiss.ch. 2012. ^ "Portable Garage - WeatherPort". ^ Krauss, Justin. "Garage Flooring Options". Garage Flooring LLC. Retrieved 24 May 2016. ^ "Rebuilding HP's Garage". Hewlett-Packard. Retrieved 30 June 2013.